What is a missing letters Puzzle? Where can i get Missing Letters Puzzles? 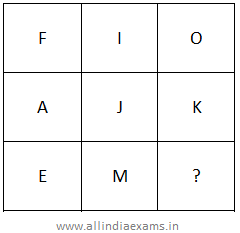 AllIndiaExams Provides various kinds of fully solved Missing Letter puzzles with solution or answers. All freshers, students and job seekers can download Missing Letter puzzles with answers as PDF. In this section we have provided Missing letters puzzles to improve your skills in order to face the interview, competitive examination and various entrance tests. How to solve Missing Letters puzzles? 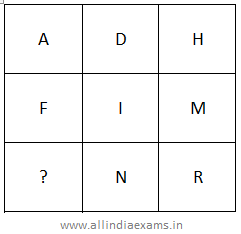 You can easily solve Missing Letters puzzles after practising the provided excercises in AllIndiaExams. Missing letters puzzles. Candidates who are looking for Missing Letter Puzzles Questions do not need to go anywhere because a candidate can get free Missing Letters Puzzles MCQ Questions on this web page. To solve all these Missing Letters Puzzles Quiz people have to practice more and more Missing Letters Puzzles Online Test. On this page, our team is providing Missing Alphabet Letter Puzzle Quizzes tricks to solve questions easily. So contenders learn and practice the Missing Letters Puzzles Multiple Choice Questions to secure more marks in the Missing Letters Puzzles Quiz. While going to participate in any commutative exams, people should know about Missing Letters Puzzles Questions and answers which are provided in the following section. Practicing more and more it will help the intenders to gain more knowledge on Missing Letters Puzzles MCQ Questions. In order to crack the vast competition, people need to practice as much as required. If people exercise Missing Letters Puzzles daily, candidates will soon start to see the improvements in your concentration and overall brain power. So our main advice to all contenders that begin preparing now in the following section to get a grip on the Missing Letters Puzzles Online Test. Candidates want to learn more about easy Missing Letters Puzzles Questions refer to this web article. For those candidates, here is the place to start. Our team has handcrafted these Missing Letters Puzzles MCQ Questions for people best preparation. All of these free Missing Letters Puzzles Quizzes can be solved by using a simple logic which as described in this article. Contenders while practicing the Missing Letters Puzzles Questions and answers people will improve their knowledge and capability. So we suggest the applicants keep on practicing the Missing Letters Puzzles Quiz from this article. 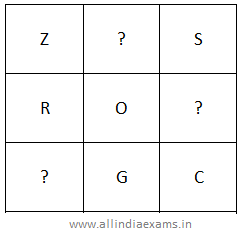 There are various ways that every aspirant can use this Missing Letters Puzzles Questions for multiple choice tests. The first every contender need to do is during your test preparation. Our main advice to all the viewers should try a few Missing Letters Puzzles MCQ Questions before going to tackle a practice test. After practicing the Missing Letters Puzzles MCQ Quiz, postulates can see the difference. The biggest challenge that most students should face with the Missing Letters Puzzles MCQ format is the logic skills required. While answering the Missing Letters Puzzles MCQ Quiz students can see the answer by clicking on the View Answer button. And also contenders can do the rough work in the Workspace which is provided beside the View Answer tab. 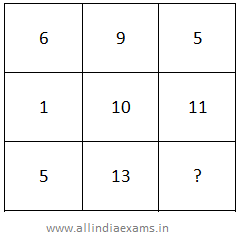 To know more data about Quizzes stick to our site Allindiaexams.in. Missing Letter Puzzle: Replace the question mark with correct letter? The letters A-Z are valued 1-26. In each set, the sum of the values of the four outside letters, divided by the value of the middle letter, is equal to the value of the bottom left letter, so the mystery letter is F (6). 2. Missing letter puzzle: Find the missing letter from the below series? 3. Missing Letter Puzzle: Find the missing letter from the below series? The letters in the second and third rows are five steps ahead of those in the first and second rows respectively. So, the missing letter will be five steps a head of F, which is K.
4. Missing Letter Puzzle: Find the missing letters from the below series? The letter in the second column is three steps behind that in the first column, and the letter in the third column is four steps behind that in the second column. So, the missing letter in the first row will be three steps behind Z, which is W.
The missing letter in the second row will be four steps behind O, which is K.
The missing letter in the third row will be three steps ahead of G, which is J. 5. Missing Letter Puzzle: Find the missing letter from the below series? Clearly, 1st column + 2nd column = 3rd column. Now, 5 + 13 = 18. So, the missing letter is the 18th letter of the alphabet, which is R.